FRAMINGHAM – Edgardo Torres, who missed much of the campaign season helping victims of Hurricanes Irma and Maria, by volunteering with the Red Cross in the Caribbean was elected to represent District 9 as its first city councilor. Torres, 33, was also the youngest individual elected in yesterday’s historic City of Framingham election. He was one of 9 district councilors and one of 11 council members total elected. 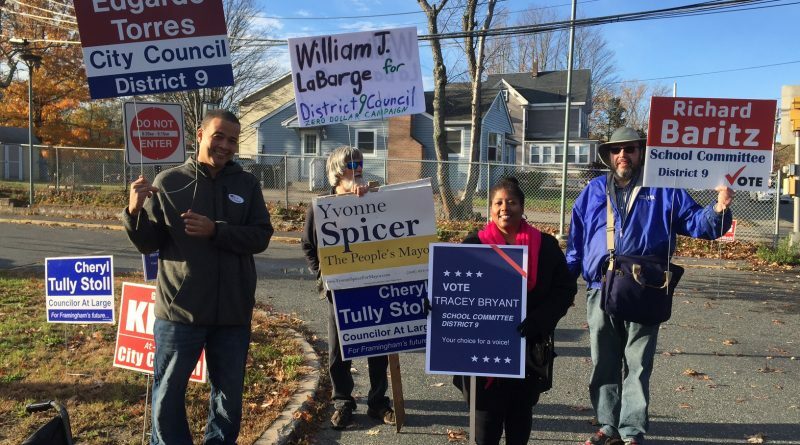 Tracey Bryant defeated Town Meeting member Richard Baritz to win the District 9 School Committee seat. The District City Council seat and the District School Committee seat is for a 2-year term, which begins on January 1, 2018. Bryant won 249-148. She recieved 54.49 percent of the vote. Torres defeated Town Meeting member Willie Labarge 252-161. He received 55.14 percent of the vote. “I just want to thank everyone in District 9 who took the time to go out and vote. I am so grateful for this opportunity,” said Torres, who is the lone hispanic elected to the City Council. Bryant was not available for a statement. Overall 15,731 of Framingham’s 40,162 registered voters participated in the election on Tuesday. That was 39.17 percent.